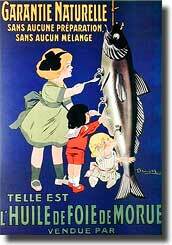 When I was a kid, I distinctly recall the daily ritual of ingesting an oversized spoonful of cod liver oil. Let’s just say, I would stare at it for a long while, as my mouth was very reluctant to open up. No, the “airplane” did not have a landing pad in my mouth, nor does the “choochoo train”, or the “buzzing bee”, and certainly not for a huge spoon filled with cod liver oil! Blechhhh! Refined fish oils have long been known to have a variety of health benefits: Omega 3s and vitamins A and B, which promote brain development, bone strength, and vascular system. They have found that a diet high in Omega 3s outweighs the environmental pollutants of the fish consumed, and this could potentially aid in your child’s mental development.